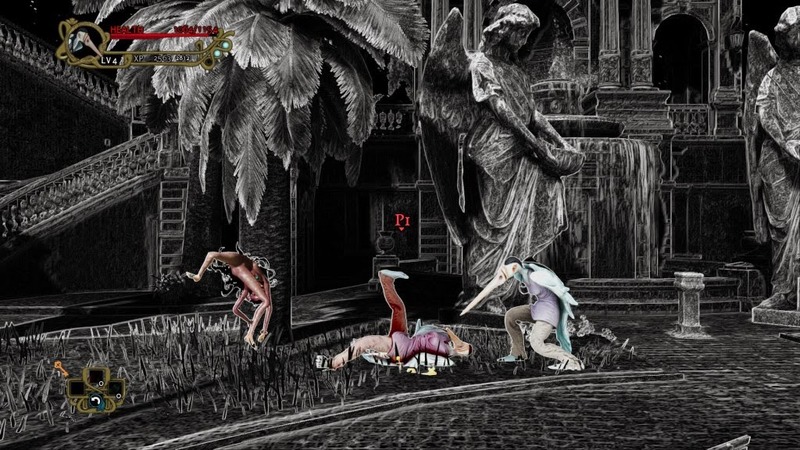 Abyss Odyssey poses something of a challenge when it comes to critiquing it. On the one hand it is undeniably a flawed game; a victim of an indie development budget and the lack of development heritage and experience in South America. See, in places like the UK, America, Japan and Canada, talent breeds talent; aspiring developers get to rub shoulders on a daily basis with industry veterans and legends, and the benefit that has in developing their skills as game designers can't be underestimated. On the other hand, in places like South America, where the games development industry is so young, it's a bit of a "wild west." The developers of Abyss Odyssey, ACE Team, might be one of the largest and is certainly the most talented developer in the region, but it clearly suffers from the lack of infrastructure and talent development around it. But on the other hand Abyss Odyssey stands as proof of something I hold very dear; the potential for video games to express culture. I've argued in the past that the development of games as an artistic endeavour will suffer so long as they are homogenised to appeal to a single audience (America). Just like the film industry has evolved to the point where artists can be confident in making films that speak to themes important to their local communities, and then see these films find international success on the foreign film scene, so too would I like to see more games start to gain worldwide distribution while representing a local community. 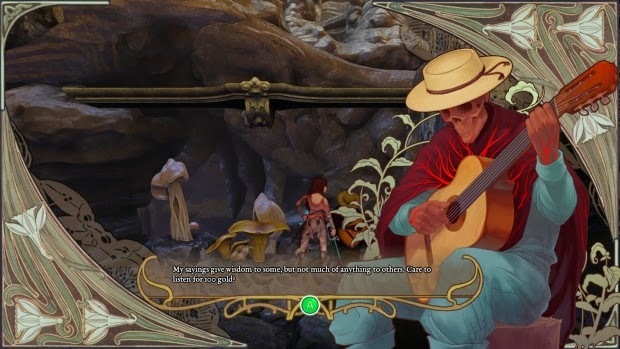 And that is why I love Abyss Odyssey; this game is South America to its core, and so it can be considered quite genuinely unique. I like games that teach me something, or inspire me to learn. If, while playing a game, I've got Wikipedia open, or it inspires me to head over to Amazon to buy a book, then I'm secure in saying it's an inspiring game. And this is precisely what Abyss Odyssey did; as I was playing I was checking all of the references the game makes to South American mythology against their Wikipedia pages, and because I've discovered that I rather like South American mythology now, I've got a couple of books in the mail as I write this. As a roguelike, Abyss Odyssey isn't loaded with extended dialogue sequences. Rather, it tells a story through its design. Enemies include the Voladora and the Camahueto. 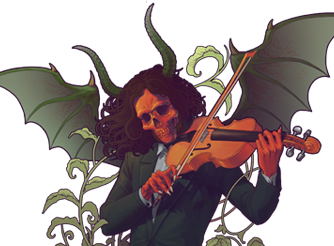 South America's fascination with skeletal demons is manifested through a peaceful guitarist that doles out traditional phrases of advice, and a violinist, Paganini (named after but in no other way resembling the historical Italian superstar) who is something I don't want to spoil for people in this review. These beings, based on the concept of el Coco, have made their way into popular culture thanks to comic book icon Ghost Rider, but their presence and being is very different from that "hero" when present in the traditional folklore expressed in Abyss Odyssey. 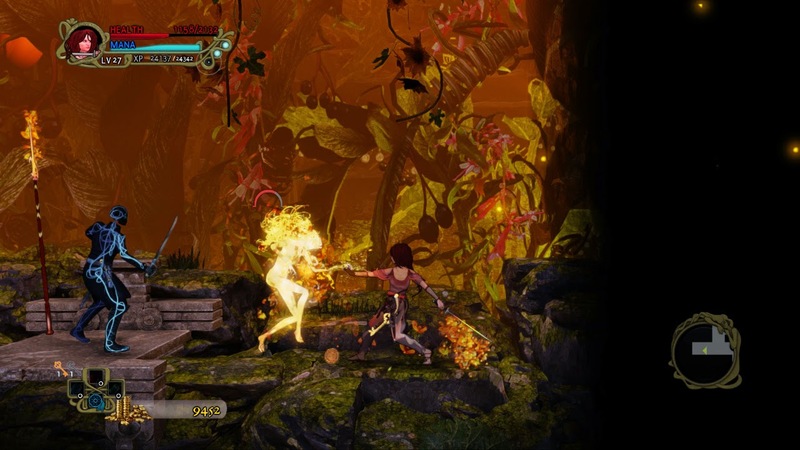 In fact, Abyss Odyssey works a little like Demon's Souls and Dark Souls in the way it tells the narrative. The explicit story is very straightforward: a warlock has fallen asleep and his nightmares are manifesting themselves as a massive dungeon that has appeared beneath the city of Santiago. And the monsters are starting to crawl out, and so you'll need to take control of one of three heroes - all also loosely based on real creatures of South American folklore, and descend into the abyss to defeat this warlock and prevent his nightmares from causing more damage. That's it for the explicit narrative, but ACE Team has cleverly worked narrative into the game's very core, and for people who are keen to learn more about the world they're exploring, then this game can set them off on months of research. The monsters each have backstories of their own, but the developers have left that to you, the player, to learn about. If you want to simply beat them up, then you can. If you want to know why there's a demon-bull with a big horn attacking you, then your experience with Abyss Odyssey will be enrichened for your initiative in learning about him. Further, as you progress through the game you'll find "warlock pages," which describe the backstory behind the warlock himself, and within these pages the game points you in further places to do supplementary research. I like games that encourage people to learn about their meaning. I'd like to see more games feature this kind of implicit and environmental storytelling. If you do buy the game I encourage you to do the extra reading, as I think you'll appreciate the game more afterwards. The other benefit to this approach to storytelling is that it infuses the game to its very core with a consistent and meaningful atmosphere. There's not a single character, environmental backdrop, or line of dialogue that seems out of place, and this is the benefit of having a development team working with material from their own culture, and not seeking to reinvent mythology to squash it within a game with a more commercially-safe generic setting. For a point of comparison, consider the Castlevania series which has long had a tradition of taking the Gothic genre and then sticking monsters like Cthulhu in it. As good as those games often are, they're never the most consistent experiences and very rarely lauded for their narrative. By contrast, Dark Souls is a true Gothic nightmare and it's one of the finest game narratives we've ever seen. Similarly, Abyss Odyssey is a shining example of how to use cohesion between the explicit narrative and the character design, monsters, and environments to tell a story. All of what I've described above forgives the game for its numerous gameplay weaknesses. To run over a laundry list; firstly, it's a roguelike that's not especially difficult. I completed the game for the first time on my second attempt, and I'm not even that great at fighting games, which Abyss borrows heavily from with its counter-and-combo heavy action fighting structure. While there are ways to artificially up the challenge to make it harder for yourself, it should never be this easy to work through a game in this genre. Secondly, roguelikes always feature random level design, but never has it been so uninspiring or limited as it is here. By the third run I'd seen everything this game could randomised many times over. 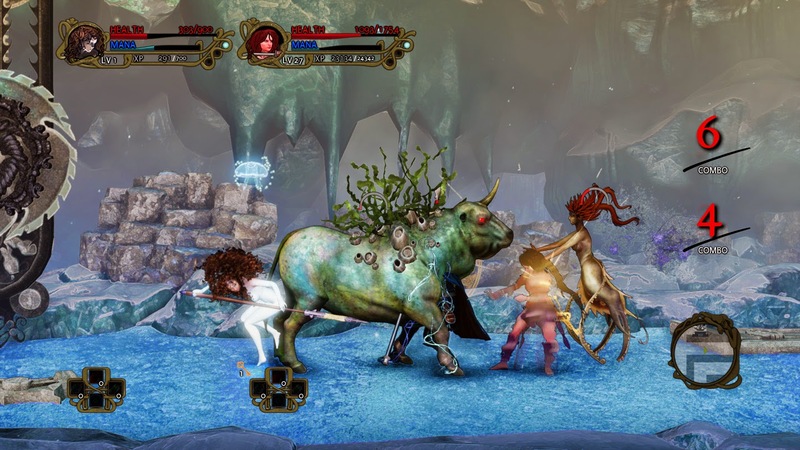 Thirdly, roguelikes need loot, and the loot in Abyss Odyssey is limited and uninspiring. Finally, while the combat is vivid and complex, the enemy AI is in the habit of having bouts of extreme insanity where they will repeat exploitable mistakes over and over again. Thematically there's a severe flaw in Abyss Odyssey as well. In what is meant to be an incredibly dark and frightening world, the fact there is no real punishment for failure kills any sense of danger in plunging into the very depths of hell. A death simply returns your hero or heroine back to the start of the adventure (or if you've paid cash for a "camp token," wherever in the dungeon you placed that token). The important stuff that you've earned in the dungeon - the experience, gold, and weapons - are not taken away from you. In other words, it's a setback, but given that the warlock can be defeated within approximately two hours of play, it's not a major setback to have to start from the top again. Other roguelikes are happy to take all the loot and reset your character to level 1. Had Abyss Odyssey done this I imagine certain critics would have slammed the game for being "unfair," but I would have appreciated the team's dedication to creating a challenge that could punish mistakes. But, as I said, I was readily able to forgive all of these flaws, because while they do indeed mean that Abyss Odyssey is objectively speaking a less than perfect game, none of the flaws are deal breakers that impacted from my ability to enjoy the atmosphere and overall experience. The point here is that Abyss Odyssey is a thematically deep game. On the surface it's a simple action platformer crossed with roguelike, but under that surface is a true rarity; a game made by South Americans that rejoices in South American mythology. As someone who wholeheartedly believes that games should be more creative and better reflective of the vast world of mythology and culture out there, it would be criminal of me not to encourage this kind of approach to game development. Item Reviewed: Review: Abyss Odyssey (Sony PlayStation 3) 9 out of 10 based on 10 ratings. 9 user reviews.